Hitch Hiker, a 1989-90 painting by Peter Doig on display now at the Schirn Kunsthalle via Tate Modern. A Peter Doig retrospective is currently on display at at Schirn Kunsthalle in Frankfurt am Main, Germany. The exhibition spans the past two decades of the Scottish artist’s work and follows two major retrospectives held earlier this year, one at the Tate Modern, London (as reported by Art Observed in February here) and the other at the Paris Museum of Modern Art. On display are 50 paintings, 130 painted posters, and a group of works on paper. The showcased works include some of Doig’s most famed landscapes and primarily reflect his childhood spent in Trinidad and Canada, and the cityscapes of London where he spent the greater part of his adult life. Although Doig often uses photographs as a reference his paintings are not of specific places and are equally influenced by past memories creating a signature style that has both photo-realist and abstract qualities. In addition to the exhibition Doig has also set up a special series of film screenings of his selection entitled STUDIOFILMCLUB in Frankfurt. Man Dressed as a Bat by Peter Doig via Telegraph. 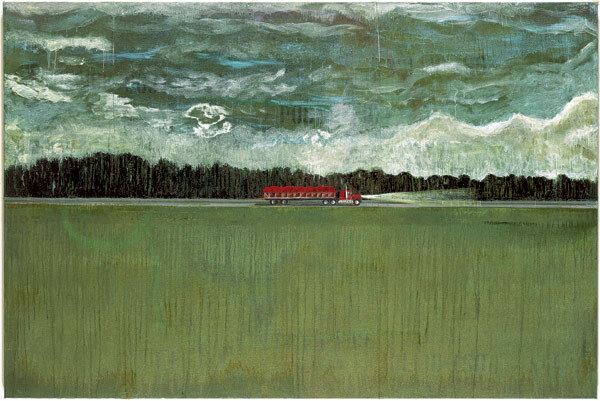 The above 2007 painting was created in Trinidad where Doig has spent the past five years of his life. A major focus of the exhibition is the artist’s recent works influenced by life in Trinidad. 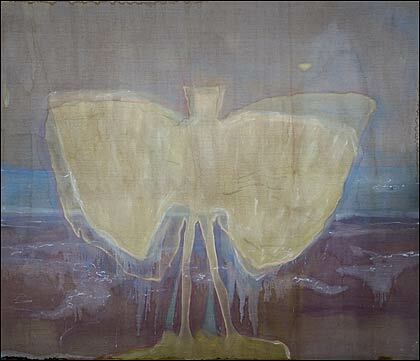 The artist as refered to his recent paintings as “pure paintings” stating that they are more abstract than his previous works which were inspired largely by photographs. 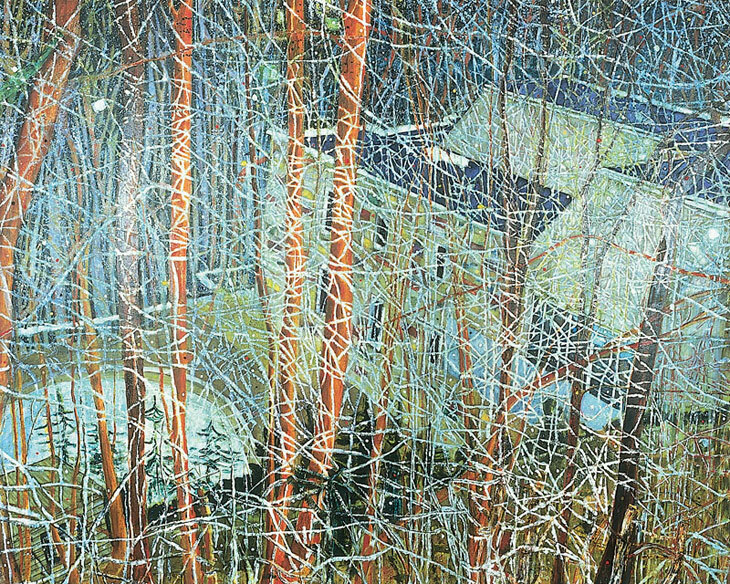 The Architecht’s Home in the Ravine by Peter Doig, via Saatchi Gallery. The above painting, like many of Doig’s works, show images overlapping and recalls a winter scene influenced by his Canadian childhood, a constant theme in the artist’s work. This entry was posted on Friday, October 24th, 2008 at 2:23 pm	and is filed under Go See. You can follow any responses to this entry through the RSS 2.0 feed. You can leave a response, or trackback from your own site. Hiya!. Thanks a bunch for the blog. I’ve been digging around for info, but i think i’m getting lost!. Google lead me here – good for you i suppose! Keep up the great information. I will be coming back in a few days to see if there is updated posts.